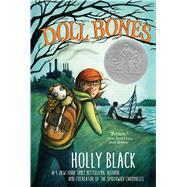 Discover the Newbery Honor winner Doll Bones, from Holly Black, the cocreator of the Spiderwick Chronicles. A Kirkus Reviews Best Book. A School Library Journal Best Book. A Booklist Editor’s Choice Books for Youth. A Publishers Weekly Best Children’s Book. A NYPL “100 Titles for Reading and Sharing.” A People Magazine “Best New Kids Book.” Six starred reviews! Zach, Poppy, and Alice have been friends forever. And for almost as long, they’ve been playing one continuous, ever-changing game of pirates and thieves, mermaids and warriors. Ruling over all is the Great Queen, a bone-china doll cursing those who displease her. But they are in middle school now. Zach’s father pushes him to give up make-believe, and Zach quits the game. Their friendship might be over, until Poppy declares she’s been having dreams about the Queen—and the ghost of a girl who will not rest until the bone-china doll is buried in her empty grave. Zach and Alice and Poppy set off on one last adventure to lay the Queen’s ghost to rest. But nothing goes according to plan, and as their adventure turns into an epic journey, creepy things begin to happen. Is the doll just a doll or something more sinister? And if there really is a ghost, will it let them go now that it has them in its clutches? Doll Bones is a winner of the Newbery Honor, is the recipient of six starred reviews, was on five Best Book lists, and was called “perfect” by The New York Times.